Over 200 elected Labour officials have written an open letter to Jeremy Corbyn calling on him to support a ‘people’s vote’. 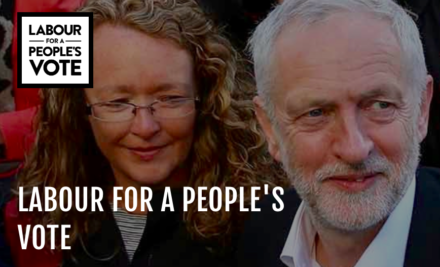 Organised by the pressure group Labour for a People’s Vote, hundreds of Labour representatives – including councillors and assembly members – have told the Labour leader that a fresh EU referendum is “absolutely necessary”, if not “risk-free”. “An extension of Article 50 can be secured and Labour should ensure May’s deal can only be implemented if supported during a new referendum. The alternative option in that referendum should be for Britain to stay in the EU,” the letter reads. Signatories include council leaders Lib Peck, Debbie Wilcox and Steve Cowan; Fleur Anderson, recently selected as the next parliamentary candidate in Putney; London assembly member Tom Copley; and directly-elected mayor Phil Glanville. Mike Buckley, director of Labour for a People’s Vote, commented: “Labour councillors listen to their constituents every day and hear their concerns about how Brexit could affect their lives. They know that people are worried about their jobs, local public services and their children’s futures if Brexit goes ahead.